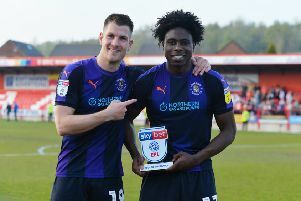 Luton’s transfer business on deadline day last week was being undertaken with one eye on playing League One football next season, according to boss Nathan Jones. The Hatters are red hot favourites to win promotion this term having established a healthy lead over their nearest rivals with 15 games to go and further strengthened their squad with three new additions ahead of the window closing on Wednesday evening. As eventually, whether it’s with me or with someone else, the club will get there, we firmly believe that as a football club. Jake Jervis and Lloyd Jones arrived on undisclosed fees from Plymouth Argyle and Liverpool, while Ipswich midfielder Flynn Downes joined on loan until the end of the season. Speaking about the incoming trio, Jones said: “Without being arrogant, without being too confident, we always recruit for the next level. “As eventually, whether it’s with me or with someone else, the club will get there, we firmly believe that as a football club. “Now that’s not us being arrogant in any way, but you have to plan that. “As if you don’t, when you get there, if you’ve just recruited players to get you out of one level, then you’re going to have a big overhaul and it’s going to take you time. “Now it’s a gamble, because the levels are different and you have to have a certain type of player to get out of this level, but we hope that we can and then we would be ready for the next level with what we’ve done. “So that’s always at the forefront of our thinking when we recruit, especially when we put people on contracts and people are on longer than a year contract for example.